Would it sound strange to buy sneakers without the laces, or a sandwich and throw away the bun? Well, it seems to be in this culture of ours, we’ve grown accustomed to eating just part of a whole food, and tossing away the parts that matter most. We peel our apples, we separate eggs into their respective white and yolk parts, we strip our grains of all their exterior nutrients to make pristine, white everything, and we lop the tops off our root vegetables. Stop the insanity! Foods are whole for a reason – they are all perfect packages of well-balanced nutrition – designed that way for our benefit. Beets are a perfect example of this. Fortunately, this time of year, you can find them in their whole state, with the delicious green tops attached! It’s like getting two vegetables for the price of one! Here are some other vegetables that you can eat (gasp!) whole. Celery – the root bulb is tasty and surprisingly potato-like; it’s called celeriac. Cilantro – the roots are super nutritious and contain the most flavour. Kohlrabi – both greens and roots are delicious! Garlic – eat the unopened garlic flowers in the spring; they are called scapes. Leeks – don’t just eat the white parts – the tops are good for you too! Broccoli – the tree trunks are just as yummy as the tops. Poor little beet greens, often tossed away by your grocer and forgotten. A trip to a farmer’s market or good grocery store this time of year will reward you with the leafy beauties that are still in season. They are loaded with carotenes and minerals, such as calcium, iron, magnesium, phosphorous, vitamin C, E, B6, B1, B2, B3, folate…the list goes on forever! They are also amazing when juiced. Beetroots are also a wonderful source of nutrition and have been used for medicinal purposes since ancient times. They have a cleansing effect on the liver, and aid digestion and the lymphatic system. Beets tone the blood and build red blood cells. Together, roots and greens are hard to beet! 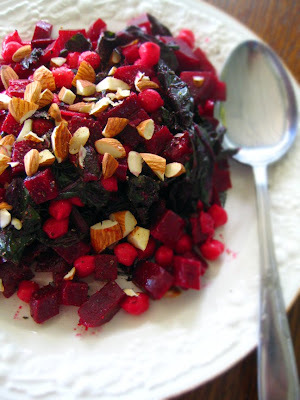 Here’s a simple recipe that uses both nutrient-dense parts of the beet plant – the roots and the greens. Select the freshest beets based on the look of their tops: they should be bright green, crisp and perky. Avoid beets greens with brown spots and ones that look limp. The greens should be consumed within two or three days, while you can save the roots for later. 1. Scrub the beetroots and place whole in a steamer to cook until tender – 30-40 minutes. 2. Separate the beet roots from the greens. Wash greens thoroughly by submerging them in water and agitating. Remove from water bath, shake dry, and roughly chop into strips. 4. In a large skillet, heat 1 tablespoon of olive oil and sauté garlic for 3 minutes. Add sliced greens and cook uncovered for 5 to 7 minutes, until wilted. 5. Just before serving add beet greens to the beetroot and chickpea mixture. Garnish with chopped walnuts or almonds for crunch. Exploring farmers markets is a wonderful way to understand how plants are grown. Ask the vendors which parts of the plants are edible and which are not. And find some recipes that include both parts of your favorite fruits and vegetables to get the most for your money – nutrition, taste, and a few pennies pinched! Another vegetable that is just wonderful but you can eat the entire plant is radishes and the root of the radish can be cooked the same way that you cook potatoes and the tops can be stir-fried or in salads. What a lot of people don’t realize is that the entire plant of sunflowers and hollyhocks are also wonderfully deliciously edible. Here’s to a fabulous meal and thanks for all your information! Just wish to say your article is as astounding. The clarity in your post is just great and i could assume you’re an expert on this subject. Well with your permission let me to grab your feed to keep up to date with forthcoming post. Thanks a million and please carry on the enjoyable work. I was just seeking this info for a while. After 6 hours of continuous Googleing, finally I got it in your web site. I wonder what is the lack of Google strategy that do not rank this kind of informative websites in top of the list. Usually the top websites are full of garbage. Hi! I’ve been following your web site for a long time now and finally got the courage to go ahead and give you a shout out from New Caney Texas! Just wanted to say keep up the fantastic work! I truly wanted to type a simple message to thank you for all the magnificent techniques you are sharing at this site. My extended internet lookup has at the end of the day been compensated with high-quality insight to go over with my classmates and friends. I ‘d suppose that most of us readers actually are undoubtedly blessed to exist in a remarkable network with many awesome individuals with useful tricks. I feel very much fortunate to have used your webpage and look forward to many more awesome times reading here. Thanks a lot again for a lot of things. Machines like this really should be distributed world-wide. People today need to be extra conscious about their wellness and must have a very routine yearly check-up. Following losing a beloved a single from cancer (breast cancer), hearing information about early detecting device for a few other forms of cancer is enlightening. I found this dish in your recipe collection and it sounds great! I was wondering, though, do I have to steam the beets with the greens still on? I am confused because I would wash the greens first before steaming it, but you say to steam the whole root first. So glad you post the bit about cilantro and beets. I always hesitate to buy beets at farmers because I know I should use the greens, but always curious how. Spent time chopping cilantro yesterday and thought “I need to look into if the stems actually need to be tossed”. Thanks for the info! I LOVE this salad, and would like to post it on pinterest, but it will not allow pics from your site to post for some reason (I’ve tried a few others too). Let me know if you have any suggestions, Thanks! How would I go about contacting you for questions? Good point, I love the shoelace allegory! This salad looks and sounds absolutely delicious. this looks great, I will definitely try it. I love using the tops of different vegetables- it just feels so whole.